Whenever I look back on my garden travels, I find that my favorites tend to be the smaller ones with more of a personal feel. Ones that I can take my time walking through without feeling like I have to hurry in order to see the entire garden. Recently, I visited a small garden run by Washington State University that is located in Mount Vernon, WA. The WSU Discovery Garden was designed by master gardeners and divided up into multiple smaller-themed gardens filled with creative elements. Last week, I shared with you about some of the themed gardens, including the Four Seasons, Herb, Naturescape, Shade as well as the composting area along with its ‘Yuck Bin’. While these gardens were fun to explore, I’ve saved the best for last! I am a strong proponent of teaching children the joys of gardening, so I was especially excited to explore the Children’s Garden. The gateway to the garden started down a ‘yellow brick road’ through an archway with weeping mulberry growing on it, creating the impression of entering through a green tunnel into a land of make-believe. The curving pathway that ran down the center of the garden, included the game of ‘hopscotch’. I confess that I had an overwhelming impulse to hop down the pathway, but restrained myself. But, it did bring back memories of playing hopscotch on the playground when I was in elementary school! For those who may be unfamiliar with the rules of ‘hopscotch’, there were helpful instructions. Other areas in the garden included a small playground set and a bench that encircled a small tree. Two vertical gardening towers stood sentinel in the center of the garden and was planted with strawberries and carrots. In the corner of the Children’s Garden, sat Alice with the Queen of Hearts and the Mad Hatter. An unusual ‘hotel’ was sitting off to the side. This insect hotel has lots of nooks and crannies for solitary bees and other pollinating insects to stay. In addition, insects that stay in the ‘hotel’ also help to keep damaging insects away from the garden. Insect hotels are typically made up of scrap bits of wood and hollow bamboo reeds. This hotel was quite fancy and had a roof planted with hen and chicks succulents. A giant checkerboard beckoned kids (& adults) to try their hand at a friendly game. Of course, instructions were also included. Visitors strolling along the ‘yellow brick road’ must pass underneath an arch with a flying monkey keeping watch. The next garden on our tour was the Enabling Garden. The word “enabling” means to “give someone the means to do something”, which is exactly what this garden does. It gives people with disabilities the means to garden. This garden bed was created for those who are visually impaired. It’s filled with a variety of plants along with rock to provide a variety of textures that are experienced primarily through touch. The velvety feel of lamb’s ear is a favorite of many gardeners and I find myself always reaching out to touch their leaves. White rock is used to create small planting islands and helps visually impaired visitors to experience the separate planting islands in the raised bed. A collection of ‘hens & chicks’ add spiky texture that can be touched safely. A variety of mosses also grew in the garden. This raised bed was built with a sitting ledge around it, which makes it easier for those who have trouble standing or bending over to garden. With this type of bed, you can simply sit on the edge and tend to the garden. I have several clients who have had raised beds built since they can no longer bend down to garden for a variety of reasons. At first glance, can you tell how this planting bed can be enabling? Note the empty area underneath the bed – can you see how it would make someone who was wheelchair bound or uses a walker be able to get up close to garden? Besides having garden beds to enable people with disabilities to garden, there was a helpful display with a variety of gardening tools that can make gardening easier. Each tool had a description of how it can help make routine gardening tasks easier, which is helpful for those with disabilities and even those who don’t. The display of enabling gardening tools spoke directly to my heart as a mother of a child with disabilities. My son, Kai, has a disability that affects his joints, which makes everyday tasks difficult. He loves to help me in the garden, but even using a pair of hand pruners is hard for him to use correctly. In Kai’s short life, he has had several operations, which have left him wheelchair bound for weeks at a time and having a place where he could enjoy everyday activities, such as gardening, would be a blessing. You can read about Kai’s story here. Walking through the garden, I noticed a sign pointing off to the outer area of the garden toward the Native Plant Garden. Being in the Northwest, you can imagine that the path through patches of lush greenery. As a landscape consultant, I hear of people’s frustration at trying to grow certain plants. 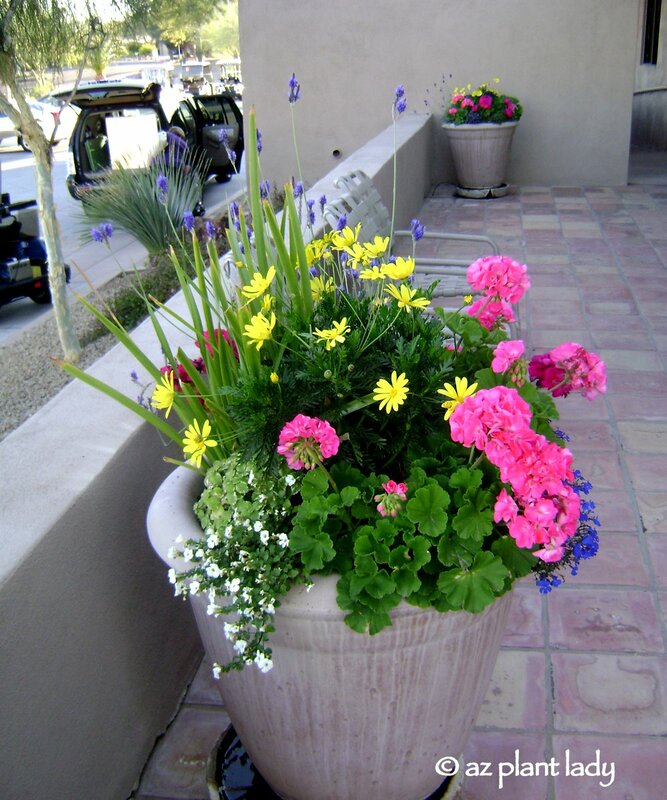 No matter where you live – the desert, jungle or in the Arctic Circle – the easiest way to garden is to grow plants that are native to your area. The next best thing is to grow plants that are adapted to your area, which are native to climates similar to yours. If you follow that simple piece of advice, you will enjoy a beautiful garden with a minimum of work since the plants will thrive with little to no attention because they are adapted to your climate. When traveling, I always like to take time to learn more about the native plants that grow there. Walking back toward the main areas of the garden, we passed by the Meadow Garden. The garden consisted of grasses and wildflowers. Throughout the year, you’ll find different flowers in bloom. The last garden we visited was the Vegetable Garden. It belonged to an infamous gardener. Mr. McGregor’s garden was a good-sized plot filled with a variety of vegetables, including some that I decided to try in my garden in the fall. This lovely row of leafy greens are green and purple spinach. I didn’t know that there was such thing as purple spinach. But, I do like to add unexpected color in my garden and so I will be sure to add this to my garden. Garlic was growing nicely and would be ready to harvest in a month. You can tell when it is ready to be harvested with the outer leeaves begin to yellow and turn brown. This crop caught my eye. To be completely honest, I’ve grown them a few times, but it is a lot of work for only a few potatoes in my desert garden so I don’t plant them anymore. A healthy crop of sugar snap peas were in full flower. I particularly love the color and shape of their flowers, don’t you? This is one crop that I do plant each year. An old wheelbarrow planted with radishes caught me eye as did the watering can with its strawberries. My brother-in-law found an old, rusty wheelbarrow for my garden and I can’t wait to plant it! It was obvious that Mr. McGregor took very good care of his garden and it was well fenced in. Thank you for joining me on a tour of this special garden. If you ever find yourself driving north of Seattle, toward Vancouver, take an hour and visit – you won’t be disappointed! On another note, we just returned from a weekend trip to Southern California where we visited my daughter, Rachele, who is stationed there in the Navy. While we always have fun visiting her, it is even more so now because we also get to spend time with our new grandson! He is absolutely darling and smiles more than any baby I’ve ever seen. 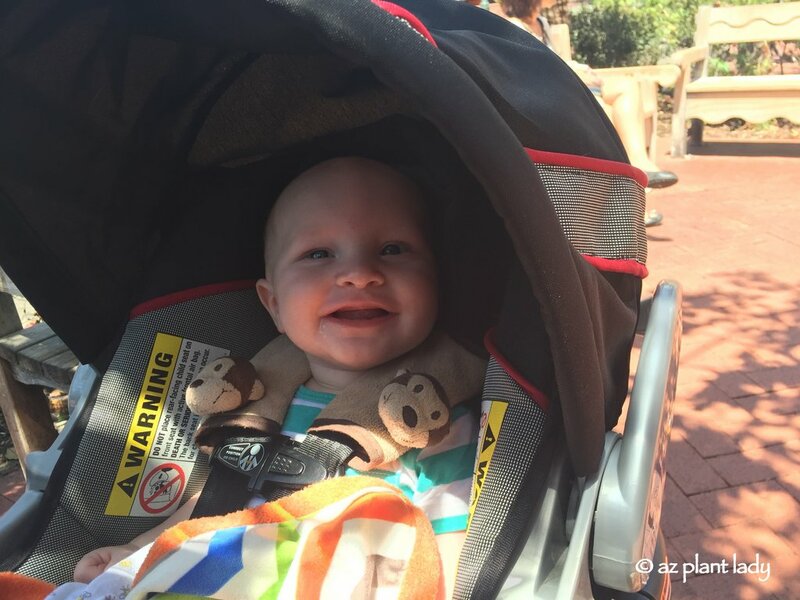 He is one happy baby! 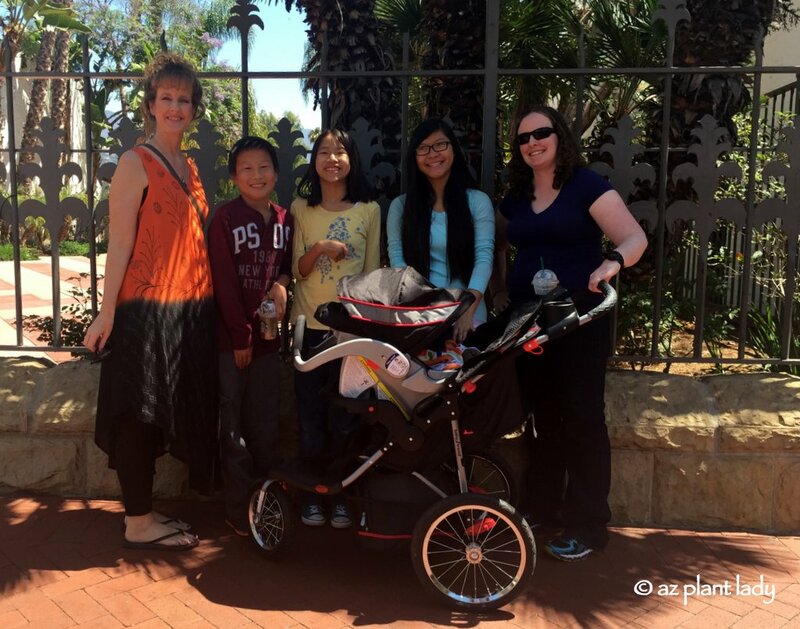 When we visit, we are able to stay on the Navy base with our daughter in her townhouse, which makes visiting her easier and less expensive than having to stay in a hotel. As often occurs whenever we visit, we usually find ourselves driving the short distance to Santa Barbara. This California city is not only a beautiful place to visit, but it also holds a special place in my heart since it is where I met my husband in college. Have you ever thought of fruits, herbs or even vegetables as ornamental plants? Often the characteristics that make edible plants appeal to our appetite, can also add beauty to the garden making edible plants a great choice for the garden as they can do double duty as ornamentals. I am always struck by how edible plants are increasingly used to create beautiful garden spaces. I’ve recently shared several of my favorite examples from my own garden as well as in during garden travels for Houzz. I hope you are inspired to look at edible plants in a new light. I do – especially in the garden. I’m always on the lookout for new vegetables to try out, including some heirloom varieties, which aren’t technically new. One year, I tried growing ‘container corn’. You can read here how it did. This year, I tried growing ‘White Icicle’ radishes, which are a cross between radishes and turnips. My mother had given me the seeds and I’ve always had a very easy time growing regular radishes, so I thought I’d try these. They grew easily and the leaves reached over 2 1/2 ft. long! It was exciting to pull them out and I couldn’t wait to try them. While they were very easy to grow, I must confess that I didn’t like them. I really wanted to and their flavor was a lot like a turnip, but they burned my mouth – much more than the radishes do. My grand experiment last year was growing Swiss chard and afterward, I wish that I had been growing it all along. It’s not only easy to grow, it also tastes great in salads! I grow it both in my vegetable gardens and in pots. So, while I wish that I liked ‘White Icicle’ I don’t. But, it wasn’t a waste of time growing them. You see, gardening is a grand experiment and it’s always fun to try growing new things and while there are going be some failures – there are also great successes (like my Swiss chard) when you discover what grows well that you like. *This week, I’m sharing what I’ve harvested from my winter vegetable garden and sharing lessons learned. Yesterday, it was broccoli and how to freeze it. Do you grow vegetables in the winter? Here in the low desert regions of the desert Southwest, we can grow vegetables all year. My winter vegetable garden is filled with a variety of cool-season vegetables and I have rarely had any problems growing any of them except for broccoli. For some reason, in past years my broccoli has been rather lackluster. Oh, the plant grows, but the broccoli heads are always small with no real central head forming. It’s been frustrating because my mother’s garden (just 2 miles away) always produces gorgeous heads of broccoli. Every year, after harvesting a small amount of broccoli stalks, I decide that it is the last time I will grow it. But come fall, I always relent and plant some more. So, imagine my delight when I ventured out in to my garden this month and found two large heads of broccoli ready for picking! So, what did I do differently? I simply planted them in a different location (about 10 ft. away) in the vegetable garden – that’s it! When planting them this year, I remembered that many people plant tomatoes in a different location from year to year to allow the soil enough time to replenish and I thought that I’d try it with my broccoli and it worked! My entire family loves broccoli and nothing compares to the flavor of fresh broccoli. But, you can also freeze it for later. To do this, you need to ‘blanch’ it by cutting the broccoli into florets and then putting them into boiling water for 3 minutes. Immediately afterward, dip the florets into cold water with ice cubes to stop the cooking. Dry the cooled broccoli the best you can and place meal-sized portions into plastic freezer bags and freeze until you are ready to use! So the lesson is, that if you grow a type of vegetable that does not seem to grow well despite doing everything right – try growing it in a different location. Come back tomorrow, when I’ll share with you a new vegetable that I grew in my garden! Earlier this week, my husband and I were doing some last minute Christmas shopping, which included as stop at one of my sister-in-law’s favorite stores. Next door, stood a grocery store – but not just any grocery store. No, this grocery store describes itself as a “boutique, gourmet market” and it has the prices to match. My husband wanted to go inside to see what types of food they had – I think he was hoping for samples. He is also much more adventurous than I am when it comes to food and gets excited when he hears the word ‘gourmet’. So we ventured inside to the fancy grocery store, which looked like anything but a grocery store. There were pine scents being wafted about and I saw about thirty Christmas trees decorating all the aisles. What really got my attention while walking through the store was the produce section. This section of the store was rather dark, except for the produce, which had bright lights showing the perfect-looking vegetables. I’ve never thought of the produce section of a grocery store as beautiful, but this certainly was. The vegetables were perfectly displayed and I must confess that I almost wanted to eat kale because of how nicely it was arranged. Seriously, there was not a single wilting leaf or blemish to be seen. It was almost as if the vegetables were airbrushed and Photoshopped. The other side was arranged with brightly colored citrus fruit. I would be afraid to pick any fruit, or vegetables for that matter, in fear that I would cause a cascade of produce falling to the floor. Needless to say, we didn’t see any samples and the prices were so high that we walked out after looking through the store. I did enjoy seeing how fancy a grocery store could be. How about you? Have you ever shopped at a “boutique, gourmet supermarket”? The baby countdown has officially started! My second-oldest daughter is having her first baby in January and we are so excited. Sadly, our daughter can’t come home for Christmas (she is in the Navy and stationed in California), since she is too close to her due date. But, we sent off her packages to her and my aunt and her family, who lives near the base, will have her over for Christmas. In the meantime, I am getting ready for my annual Christmas cookie baking with my kids, granddaughter and nieces and nephews. Every year, we make and decorate cookies that we serve at our family Christmas celebration. The kids love showing their parents the cookies the decorated. Last year, we make sugar cone Christmas trees. The kids loved spreading buttercream frosting on sugar cones and then decorating them. This year, we will be making chocolate, peanut butter Christmas trees – Yum! I’ll be sure to post photos and a ‘how-to’ next week! Have you ever been on live television? If you had asked me a year ago, I would have said “no”. I had done some filming for “how-to” gardening videos for SheKnows.com – but they weren’t live and took place in my back garden. Somehow, live TV is quite different. Last time, I told you about my upcoming appearance on our local ABC station to talk about creative container gardening tips. Posing next to my newly-planted container filled with purple basil, thyme, rosemary and parsley. White petunias add beauty to the pot. This was the second time that I had been asked to appear on Sonoran Living, which is a local morning program. Last time I was on the show, I spoke about ‘Fuss Free’ Plants. 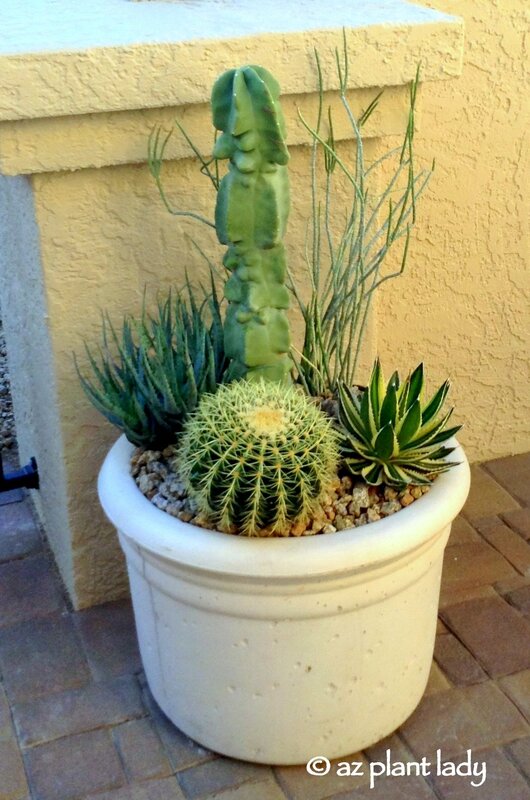 This time, I would be talking about creative tips for container gardening. So, I went shopping for my ‘props’. I decided to plant an herb container as well as a pot filled with vegetables and flowers. I bought several medium-sized pots, a variety of potting mixes and of course, plants. My sister came along with me to help with the props and setting up. I had planted the pots ahead of time, so setting up wasn’t too difficult. The main focus of the demonstration would be the three pots, the potting mixes and the recyclable grocery bag. They tell you to bring a lot of props, which look good on television. So, I brought gardening gloves, some hand tools and extra plants to help ‘set the stage’. My microphone was there for me to put on and I was almost ready. Finishing up planting my vegetable/flower container. Last time I was on the show, mine was the first segment. It went very fast and we were back on the road before the show was over. This time, I was to go last. So after everything was set up, my sister and I were invited to wait in the staff break room. To say that I wasn’t nervous would be an exaggeration. But, I was not as nervous as my first time. It’s actually not as hard as doing a “how-to” video where you have to talk to the camera. On the show, I am talking to a person who asks me questions so I don’t speak directly to the camera at all. If you lose your train of thought, they are there to get you back on track. Of the tips I shared on air – using recycled, plastic containers to fill the bottom of large pots as well as using a recycled grocery bag as a container were the most popular with the hosts. I had a great time and hope to be invited back again. Below, is the link for my container gardening segment and at the end you see where I accidentally got involved in a conversation at the end about “Dancing With the Stars”. 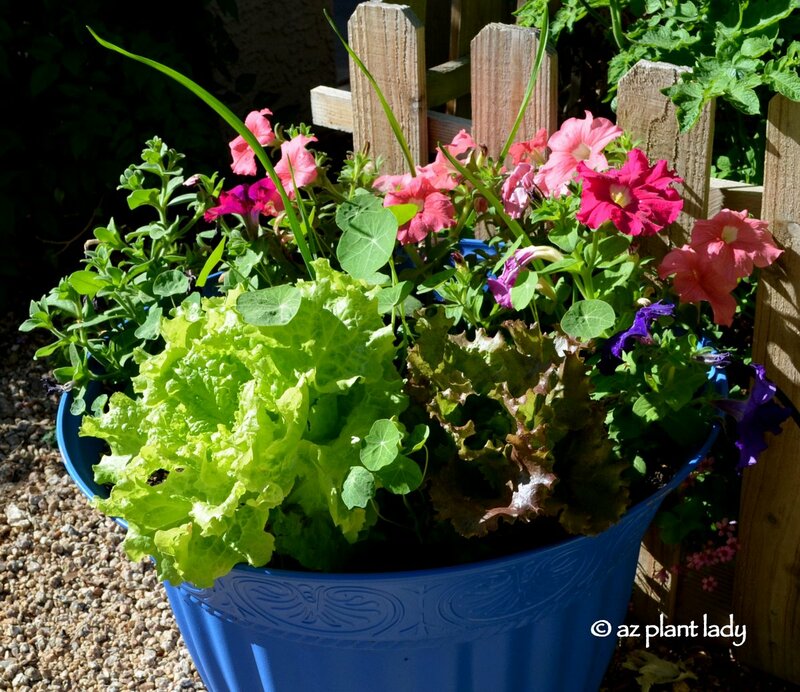 I hope you enjoy it and come away with some helpful tips that you can use when creating your own container garden. 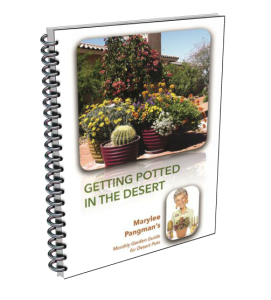 **You can view my first appearance on Sonoran Living where I talk about “Fuss-Free Plants” here.